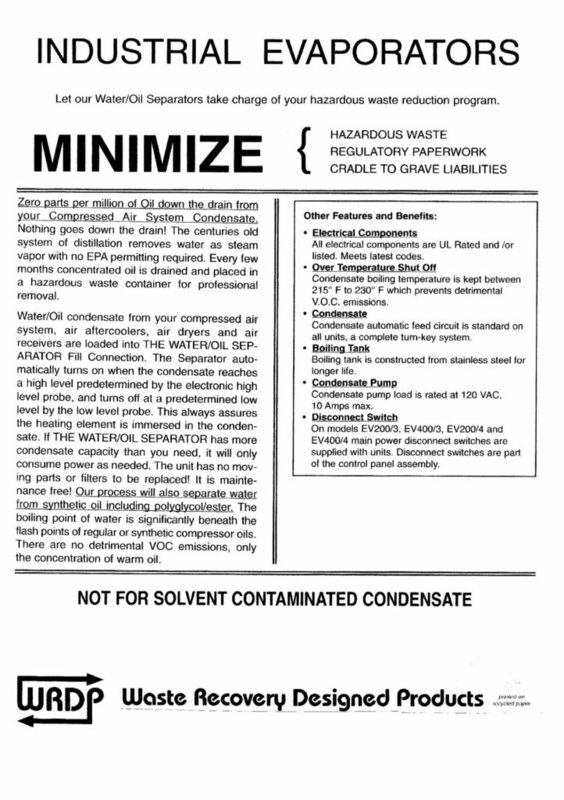 Zero parts per million of oil down the drain from your compressed air system condensate. Nothing goes down the drain! The centuries old system of distillation removes water as steam vapor with no EPA permitting required. Every few months concentrated oil is drained and placed in a hazardous waste container for professional removal. Water/Oil condensate from your compressed air system, air aftercoolers, air dryers, and air receivers are loaded into the Water/Oil Separator’s fill connection. The Separator automatically turns on when the condensate reaches a high level predetermined by the electronic high level probe, and turns off at a predetermined low level by the low-level probe. This always assures that the heating element is immersed in the condensate. 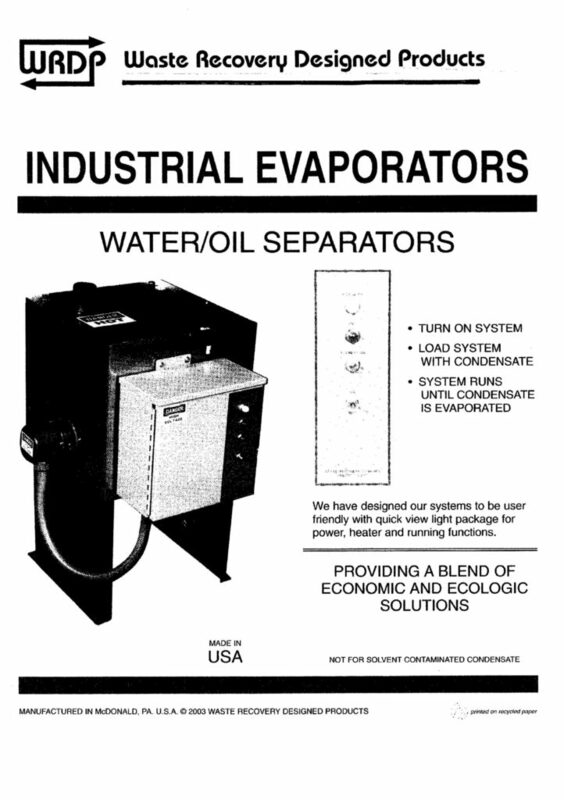 If the Water/Oil Separator has more condensate capacity than you need, it will only consume power as needed. The unit has no moving parts or filters to be replaced! It is maintenance free! Our process will also separate water from synthetic oil including polyglycol/ester. The boiling point of water is significantly beneath the flash points of regular or synthetic compressor oils. There are no detrimental VOC emission, only the concentration of warm oil. 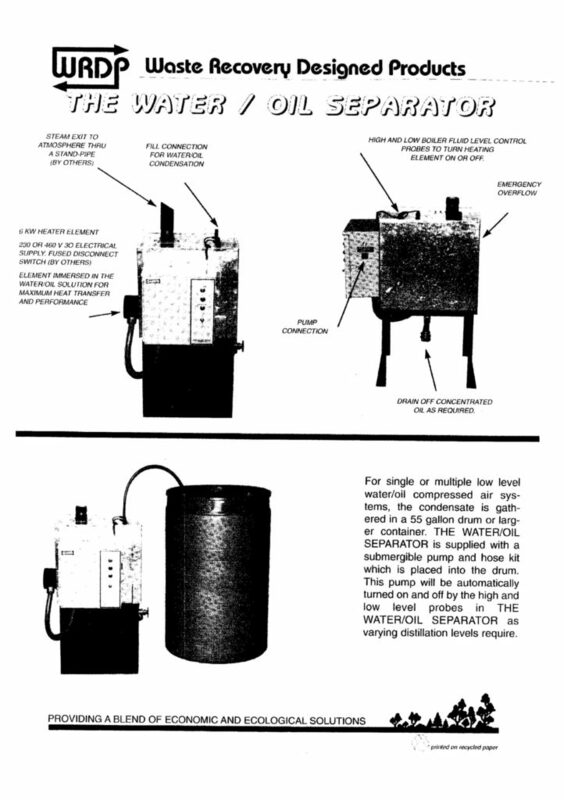 For single or multiple compressed air systems, the condensate is gathered in a 55 gallon plastic drum or larger non-metal type container. The Water/Oil Separator is supplied with a submergible pump and hose kit which is placed into the plastic drum. The pump will be automatically turned on and off by the high and low level probes in the Water/Oil Separator as varying distillation levels require. * For installation and wire gauging only! 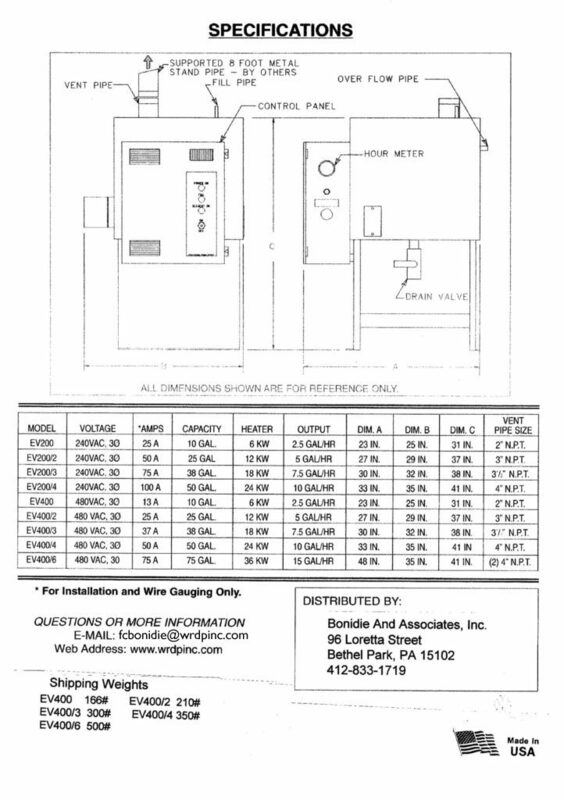 All electrical components are UL Rated and/or listed. Meets latest codes. Condensate boiling temperature is kept between 215 to 230 degrees F which prevents detrimental VOC emissions. Condensate automatic feed circuit is standard on all units, a completely turn-key system. Condensate pump load is rated at 120 VAC, 10 Amps max. On models EV200/3, EV400/3, EV200/4, EV400/4, and EV400/6 main power disconnect switches are supplied with units. Disconnect switches are part of the control panel assembly.